Any outdoor enthusiast knows how vital a good knife is – and they should also know the importance of keeping it sharp. The keener your knife’s edge the more quickly and easily it will cut. That can make all the difference when you’re in a hurry. A sharper edge will also cut more cleanly, letting you get the job done with a single stroke instead of a lot of messy hacking and sawing. It’s even safer. That seems counterintuitive – how can a razor edge be safer than a dull one? – but it’s absolutely true. Keep your blade well-honed and you can apply less force and more control. If you have to put all your strength into the knife to force it through your work piece there’s a lot more chance of it skidding out and ending up in your leg. So unless you only plan to spread butter with it a sharp knife is always better than a blunt one. When you buy a knife it should have a decent edge on it, but that won’t last forever. Every time you cut something tiny particles of metal break away from the blade, and the edge itself is the most vulnerable part. Over time the edge will slowly become rounded and its cutting ability will fade. To sharpen it again you need an abrasive that will grind the sides of the edge down, restoring the fine V profile that’s needed to deliver cutting power. Electric sharpeners – Avoid these. They use powered abrasive drums or wheels, so they work quickly, but they often remove too much metal and the heat they generate can affect the hardness of your knife. Any errors can also burr or even roll over the edge, forcing you to take off even more steel to restore it. Pull-through sharpeners – many kitchens have one of these. It’s a grip, usually plastic, with a slot containing angled sharpening rods. You simply draw the knife’s edge through the slot, and repeat until it’s sharp enough. Keeping the angle consistent can be tricky though, and you’re usually limited to one grind angle and grade of sharpener. Sharpening stones – The simplest form of sharpener, these are simply a block of abrasive. They can be ceramic, coated with diamond particles or a naturally abrasive stone. Many have a coarse and a fine side for more versatility. Sharpening stones are effective and give you a lot of control, but it tales practice and a steady hand to draw the blade over the surface at a consistent angle. Stones are very compact and the best option if you want to carry a sharpener on trips. Sharpening systems – These are the easiest way to get a really good edge. They generally come as a cased set, with an angle guide and a selection of stones, and this gives them several advantages. Using an angle guide ensures you’re sweeping the stone across the edge at exactly the same angle every time, so there’s no risk of a careless stroke ruining the edge you’ve built up. Unlike a pull-through model you can switch to progressively finer stones as your knife gets sharper. A sharpening system is usually going to be your best option. The ability to switch between coarse and fine abrasives is a real advantage. A coarse stone or rod will remove metal faster; it’s ideal for quickly restoring a really blunt knife, or reworking minor damage like chips or nicks. Coarse abrasives leave a slightly ragged edge though, so the knife won’t cut as cleanly. That’s where a finer grade comes in, polishing out the roughness to leave a perfect grind. All the best sharpening systems offer this option – and often more. Let’s look at the best ways to keep your favorite knife as sharp as the day it came out the box. The KFS Knife Sharpening System comes in a neat plastic case with retaining foam liner. There’s a lot in there, plus space for optional accessories, but the heart of the system is the knife holder. This is a tough steel frame mounted on a wooden pistol grip, with a set of jaws at one side to hold the blade. The other main component is the sharpening assembly, which consists of a guide rod and a stone holder. The sharpening assembly is a shaped wooden block with clamps at each end, and a threaded socket to hold the guide rod. Four diamond sharpeners in various grades, from coarse through to extra fine, come with the kit and any one of them can be fitted to the assembly using the clamps. This system saves space, and also means you can change grades of stone without having to remove the sharpening assembly from the frame. To use the KFS all you have to do is clamp the knife into the steel jaws – these have rubber liners, giving you a firm grip that won’t mark up the blade – and set the rod guide at the angle you want. Fit the appropriate stone to the sharpening assembly, slip the rod into the guide and you’re ready to go. What makes this really impressive is the attention to detail. Instead of a choice of half a dozen angles the guide – which includes a freely rotating Teflon guide – slides in a wide slot up the back of the frame, then locks at the desired angle with a thumbscrew. There’s a hole in the base of the pistol grip so you can fit it to an optional base, and the jaw tension is set by a substantial threaded rod instead of a flimsy screw. It’s extremely easy to use and gives great results every time. At around $180 (see here for latest) it’s ideal for the serious blade enthusiast. Verdict: A top quality kit that works on any size of blade. 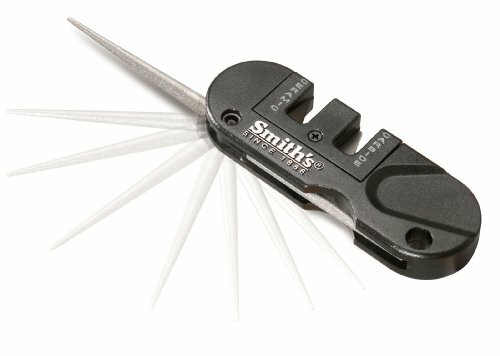 The Smith’s Pocket Pal is about as different from the KFS as you can get. It’s a tiny pocket version of the pull-through design and it costs just $8 here. It’s obviously nowhere near as capable and doesn’t give you options like a choice of edge angles, but we think it has a place – and that place is in your pocket. A full sharpening system is pretty bulky, and not something you want to take backpacking with you. If you find yourself having to use your knife a lot you can rack up some wear on the blade, though, and the Pocket Pal will let you repair it reasonably well. If you manage to chip the blade the carbide will fix that; if the edge just needs a touch-up the finer ceramic will restore the edge. There’s also a fold-out diamond-coated rod for dealing with serrations or fiddly parts of the blade. Using the Pocket Pal is as simple as it gets; just put the blade in the appropriate slot and pull through. Ten pulls will be enough for most knives. It won’t give the results a full sharpening system will but it’s quick, easy and will restore a dull blade to a usable state. Verdict: Tiny, lightweight and pretty effective – ideal to take backpacking with you. 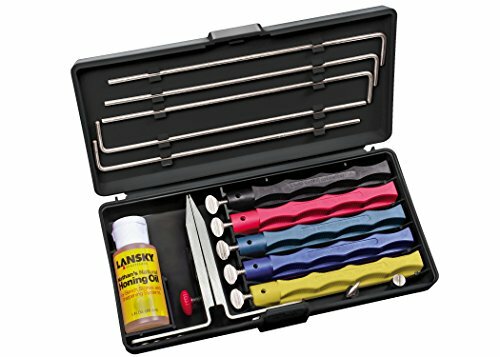 Lansky’s Deluxe 5-Stone Sharpening System[/easyazon_link] works on the same principle as the KFS but is a lot simpler and slightly less versatile. The main component is the clamp, which is operated with two screws – one to adjust the jaws to the blade thickness, and the other to apply tension. Each side of the clamp is a guide with four slots, corresponding to 17, 20, 25 and 30-degree sharpening angles. This is actually an advantage over the KFS, because the duplicated guides mean you don’t have to unclamp and reverse the blade to sharpen the other side. The supplied stones include extra-coarse, coarse, medium and fine alumina oxide ones, which can be used in sequence to progressively shape the edge (don’t use the extra-coarse one unless the edge is damaged or very blunt). There’s also an extra-fine ceramic one to add the final polish. Each stone comes in a color-coded plastic holder with a detachable guide rod. The Lansky set is slightly less easy to use than the KFS because it doesn’t have the pistol grip, but it’s still far from difficult and you get most of the performance at a fraction of the price – expect to pay around $30 (see here). 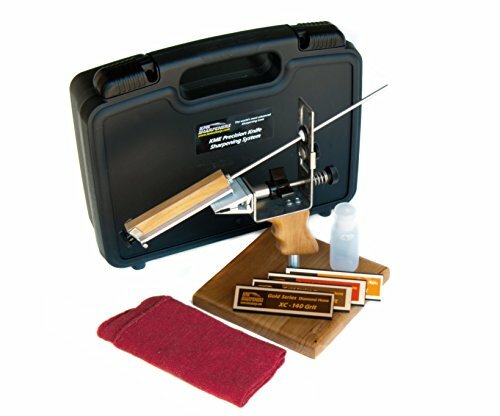 This is an effective and good value sharpening system. Verdict: An effective clamp, plus lots of stones and angles, makes for a versatile system at a great price.